Blade-type control knobs Feature highly visible markings to simplify operation and can be removed for easy cleaning. 3.9 cu. ft. oven Helps you prepare multiple courses simultaneously, so you can cook for a large group in less time. Two heavy-duty nickel-plated oven racks with a stop position accommodate a variety of cookware. Built-in griddle Provides an integrated flat cooking surface. Stainless-steel cover guards against damage. Chrome heat reflector trays deliver optimal performance. Heavy-duty, porcelain-finish grids with a fixed position offer durability. Five 9,100 BTU burners Help cook food items efficiently. Baffled oven burner Disperses heat evenly for thoroughly cooked results. Easy-access broiler with a porcelain-coated pan and tray makes it easy to prepare delicious dishes. Sabbath mode Safely maintains a temperature for an extended period of time in order to comply with kosher cooking practices. 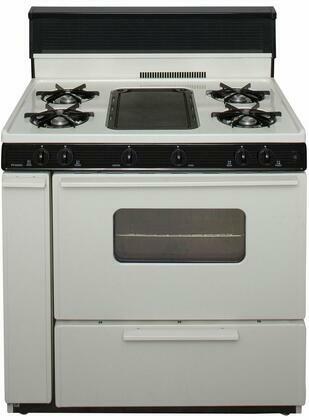 Lift-off cooktop Along with removable, dishwasher-safe burners and a removable oven bottom helps simplify cleanup. Recessed design helps keep spills in place. Bakeview window Allows you to monitor the cooking progress of your food without opening the door. Oven door seal helps retain heat. Leg levelers For stable positioning.